At least a dozen new pipeline projects are slated to carry oil from the mid continent to the Gulf Coast, potentially lowering gas prices but coming with an environmental toll. NEW YORK (CNNMoney) -- At least a dozen new oil pipeline projects are slated to move forward in the United States over the next few years, bringing controversial sources of new crude to market despite the holdup of a portion of the Keystone pipeline expansion. Some of the projects reverse the flow of existing pipelines. As early as next week the Seaway pipeline, which currently carries oil imported into the Texas Gulf Coast up to storage facilities in Cushing, Okla., will reverse its flow. That will help alleviate the glut of crude in Cushing -- a glut that's been caused by a boom in oil production from shale oil formations in the United States and oil sands production from Canada's Alberta province. Getting oil from Cushing to the Gulf Coast is essential. The Gulf Coast is where the refineries are located that can turn the oil into usable products like gasoline or jet fuel. Other pipelines will add additional capacity, such as the southern portion of the Keystone expansion that will run from Cushing to the Gulf Coast. There are additional pipeline projects planned for West Texas. Six are set for North Dakota's prolific Bakken Shale, along with 10 new rail terminals to ship the oil out via train, according to Jeff Dietert, an oil analyst at Simmons & Company, an energy-focused investment bank. All told, the new projects will have the capacity to bring at least an extra 2 million barrels a day of oil to the U.S. Gulf Coast by 2015. Where that oil goes from there, its effect on gas prices, and its environmental impact are up for debate. Good for the nation: The industry and most oil analysts think the additional oil will be used by U.S. refineries, offsetting the need of some oil imports and potentially lowering gasoline prices. The oil will likely be cheaper than where the refineries currently get most their imported crude stock -- Mexico and Venezuela -- due to fewer shipping costs. Plus, production from Mexico and Venezuela has been declining for years due to lack of investment in those oil fields. "The future supply of heavy crude from some of those places is uncertain," said Jackie Forrest, an oil analyst at the consultancy IHS CERA. Price wise, analysts say adding an additional 2 million barrels to world markets should bring down prices, if only marginally. Two million barrels is just a fraction of the 89 million barrels a day the world consumes, and there are dozens of other things that impact oil prices -- from violence in Nigeria to OPEC production decisions. But an additional 2 million barrels is still an increase in supply. "Ultimately, this will result in lower gasoline and diesel prices," said Dietert. "Without the growth in U.S. supplies, prices would be materially higher." Pipeline advocates also point to the thousands of jobs the projects would likely support, both in pipeline construction and oil field development. 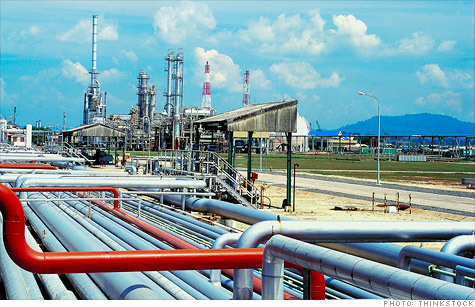 Bad for the environment: But this new production may carry a heavy environmental cost. The new U.S. oil is mostly from shale formations, which must be hydraulically fractured to flow. Known as fracking for short, the practice is controversial, with critics saying it can contaminate the ground water and lead to earthquakes. The Canadian crude comes mostly from the oil sands, which requires massive amounts of heat and water to extract and can leave vast swaths of forest looking like a moonscape. Most major oil companies now operate in the oil sands, including Exxon Mobil (XOM, Fortune 500), Royal Dutch Shell (RDSA) and BP (BP). The industry has long maintained that both sources are safe, but environmentalists don't buy it. "It's literally an environmental Armageddon happening in Alberta," said Kate Colarulli, associate director of the Sierra Club's Beyond Oil campaign. The Sierra Club is against all production from the oil sands. When it comes to fracking, the organization isn't necessarily against the process or transporting that oil by pipeline, but thinks that current regulations aren't sufficient to protect the public. On the issue of prices and exports, Colarulli said much of the gasoline made from the new oil will be exported and won't necessarily insulate U.S. consumers from high prices. The Sierra Club is working to block the pipeline expansions. It argues that the country would be better off reducing its oil consumption by 2 million barrels a day through higher efficiency standards and the adoption of alternative technologies like electric cars. But it will be an uphill battle in fighting the pipelines. The reversals require little in the way of permitting. And Obama has directed his administration to fast track the southern part of the Keystone project.